Sometimes, you need to explain every detail. Sometimes, you have to draw a picture. And sometimes, you need a PowerPoint presentation just to get your message across. Let’s face it—communicating is not always easy. Some things are not worth the effort, while others are extremely important. Smart, selective people choose their reception-area design communication carefully. They understand that what is not said can communicate more than all the words they could possibly say. 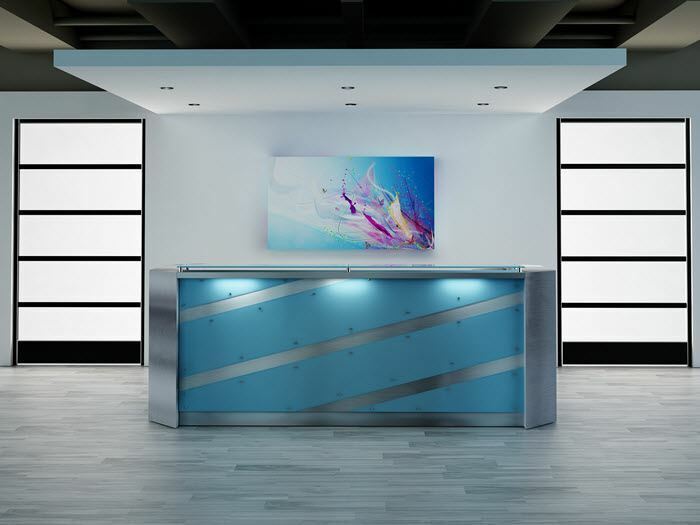 For these select people, we created the El Paso Modern Reception Desk: a tool that says it all without words. The El Paso embodies design-forward thinking by virtue of sleek lines, innovative materials, and a cohesive overall design. The El Paso is available in a footprint as small as 72" x 28-1/2" (without rear corner sections). It can also be extended to fit your unique space and user profile. The primary exterior face is done in brushed aluminum and overlaid with gloss acrylic (choose from an array of colors.) The corner ends are cut on a 45-degree angle to join the side panels, also with acrylic appointments. The work surface behind the face measures 24" x 64-1/4". The base measures 4"H, and is done in brushed metal to protect your desk from damage. Options include: glass (standard or back-laminated), lighting package, and alternate materials. The El Paso Reception Desk shown here was created as a 96"W unit with an 8" overhanging transaction top. The desk face is finished in Sky acrylic, and adorned with finishing screws for a more industrial feel. Suspended above the transaction top is back-laminate glass to match the face. Lighting is recessed under the transaction top to highlight the front design. Two rear desk ends are positioned for added storage. Priced at: $ 5,780. No problem! We can change the size, material, color, or finish for that individual match. Need to find the right reception furniture to match a budget? Let us show you how to do it affordably. It’s simple! Just tell us what you need. Call us: 855-699-0334.